In celebrating the tradition and innovation of the State’s number one industry, agriculture, the California State Fair Board of Directors, upon the recommendation of the Agricultural Advisory Council, selects Karen Ross, Secretary of the California Department of Food and Agriculture (CDFA) as Agriculturalist of the Year. Initially appointed as Secretary of the California Department of Food and Agriculture in 2011 by former Governor Edmund G. Brown, Jr., Ross was re-appointed on January 9, 2019 by Governor Gavin Newsom. Governor Newsom cited her unmatched leadership experience in agricultural issues nationally, internationally, and here in California; including environmental stewardship, climate change adaptation, and trade. During Secretary Ross’ tenure, the Department has focused on core functions to protect and promote California agriculture, investing in the Department’s employees to provide the best service to farmers, ranchers and consumers and fostering an agricultural industry that embraces its role as a global leader on everything from the most technical aspects of farming to the broadest environmental imperatives. Secretary Ross has strengthened partnerships across government, academia and the non-profit sector in the drive to maintain and improve environmental stewardship and to develop adaptation strategies for the specific impacts of climate change. She has initiated programs to provide greater opportunities for farmers and ranchers to engage in sustainable environmental stewardship practices through water conservation, energy efficiency, nutrient management, and ecosystem services; and she has worked to provide greater access to farm-fresh foods at school cafeterias through CDFA’s Farm to Fork Program. Secretary Ross is passionate about fostering the reconnection of consumers to the land and the people who produce their food, and improving the access of all California citizens to healthy, nutritious California-grown agricultural products, celebrated for their diversity and abundance in serving local, national and global markets. Secretary Ross grew up as a 4-H kid on a farm in western Nebraska. She and her husband, Barry, own 800 acres of the family farm where her younger brother, a fourth-generation farmer, grows no-till wheat and feed grains, incorporating cover crops and rotational grazing for beef production. The Secretary has a Bachelor of Arts degree from the University of Nebraska-Lincoln and is a graduate of the Nebraska Ag Leadership Program. 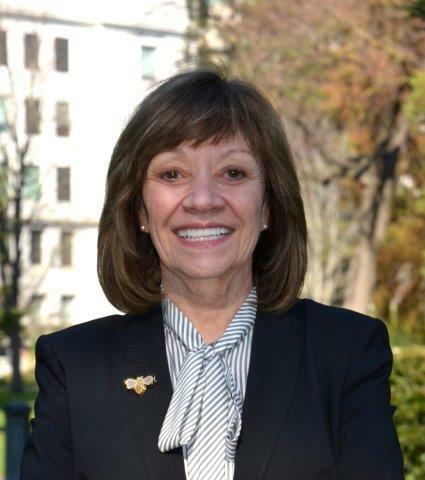 She has served on numerous boards and committees in California agriculture and with various academic institutions. Secretary Ross will be publically recognized at the California Agriculture Day on the west steps of the State Capitol on Wednesday, March 20, 2019. She will formally be honored at the California State Fair Gala benefitting the youth scholarship programs of the Friends of the California State Fair on Thursday, June 27, 2019. Ah, this is a much-deserved and not-at-all surprising designation. Karen’s total dedication and seeming omnipresence in leading California agriculture makes those who know her wonder where she gets her ceaseless energy and her ability to do it all. Her passion is admirable and we are greatly blessed to have her.